As promised last week I started to take up all those hibernating projects this week. First of all I started crocheting on my big blanket. I’m getting closer to do the edge now but it is so warm here that I can’t stand this big warm blanket in my lap for too long so it is still some way to go to finish this. 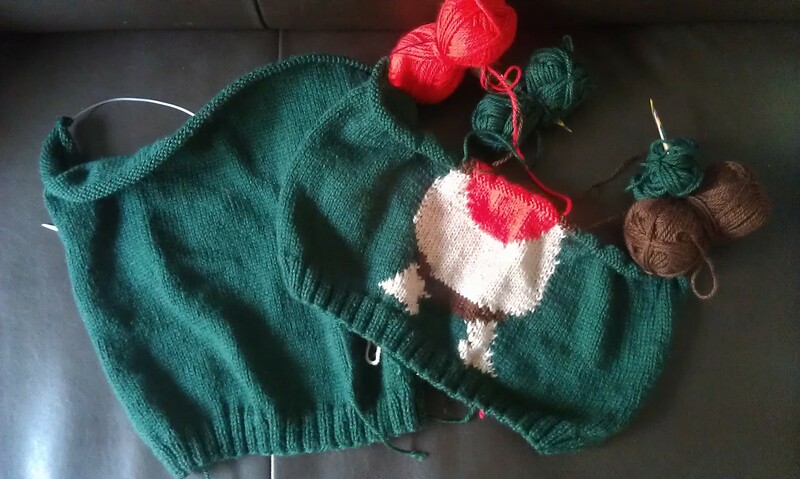 Then I took some time to finally work some rows on my brother’s christmas jumper again. I’m already more than half way through Rudolph’s nose! Yet I’m still not in love with the colourwork which makes it hard for me to pick it up. But the back is already half way, I think. The problem I’m facing is that even though I figured I found a way to make my gauge work, the height of my stitches is far less than required for the width of them (why so ever) and this means Rudolph looks squeezed. To avoid this I have to knit extra rows every now and then. So far it is working pretty well. Hope that it also works for the antler part. 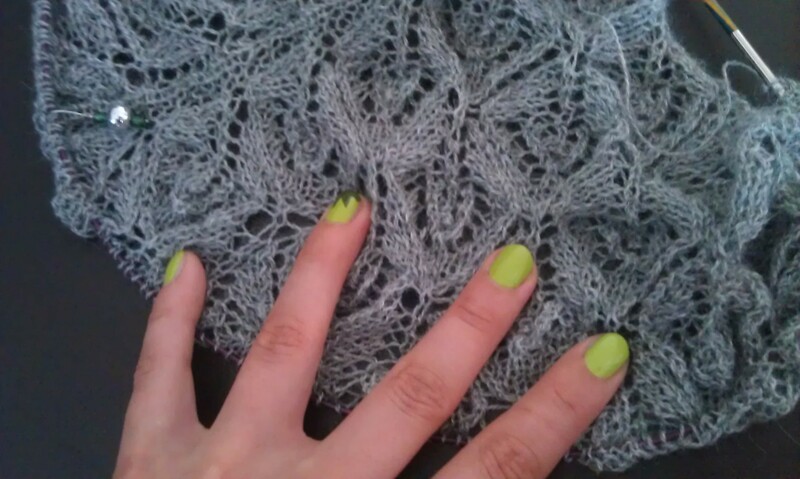 Next I fixed my lace shawl. I’m knitting a Tree of light shawl and some weeks ago I made a mistake. The pattern chart is not knitted twice but mirrored and for this there are two charts. Now I knitted the left side of it first instead of the right side. As this means only about 2-3 stitches differences I didn’t notice while knitting but when I wanted to change the chart I realised and it meant knitting back. While doing that needle and cord somehow split, dozens of stitches slipped. When I finally had rescued them all I knew I had to rip back at least one more row. And I so not felt like doing this. Weeks passed. On the weekend I finally took it up again. In the end it was two rows that I undid stitch by stitch. But then I could knit on. 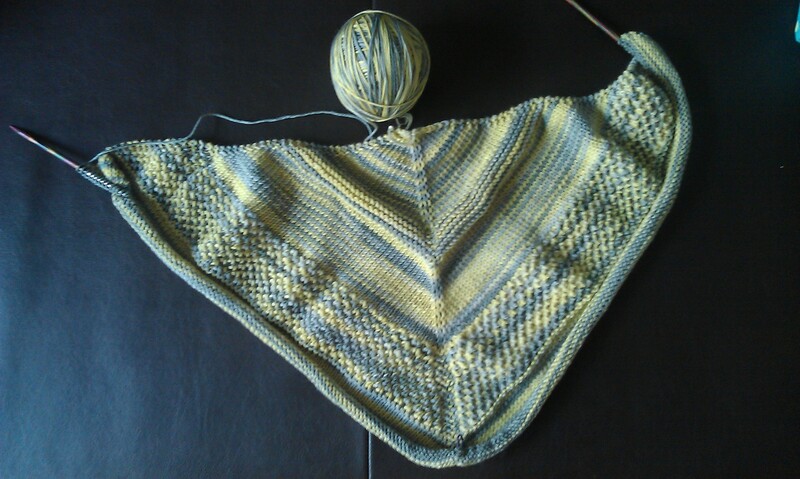 Now I’m ten rows away from being through the main chart once but it is still tiny. I need to do a lot more pattern repeats I guess. Fortunately the pattern has instructions on how to repeat again and again. I will slowly work my way through it. Next I could have gone for my popsicle dress, but who am I fooling. This one has gone into hibernation. I don’t think I will finish it this summer. It is just not interesting me at the moment. Just so much boring stockinette stitch to go. Or I could have picked up my knitted tarn carpet from earlier this year or the hexipuffs. But no, I went to my stash to determine if I have yarn for some small christmas knits. I stumbled over a skein of oh so lovely merino wool that I bought some weeks back. It’s 150gs of squishy soft thick merino wool, hand dyed in light green going yellow mixed with grey. I love it (only the green could be a little greener so you can see it is not some light greenish yellow…)! And I saw in one of the last Yarn alongs that some one was knitting a textured shawl (sorry, can’t remember who it was) and liked the pattern. And before I knew I was knitting one of those. It brings out the colour changes in the yarn pretty well, don’t you think? 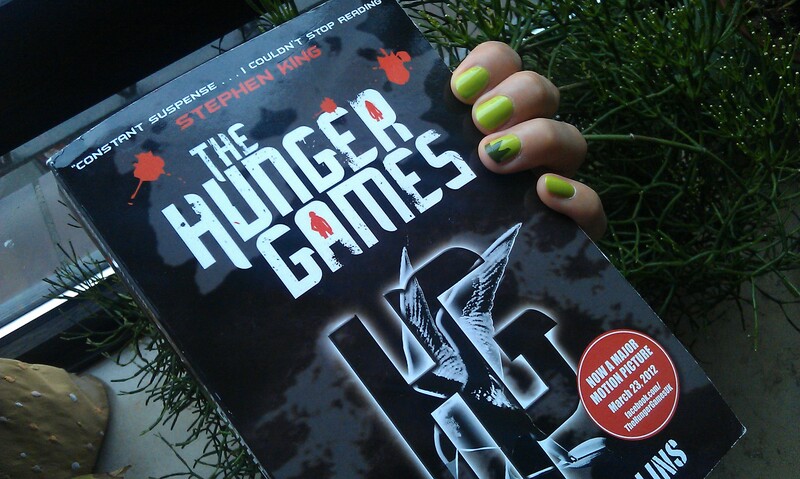 As for reading, I’ve been through the first book of the Hunger Games this weekend. After knitting the Hunger Games Cowl I thought I should as well read the books. Why was I ever hesitating reading them. This was one of the most exciting (yet brutal and sad) books I have read in a very long time. When I started reading I had to adjust to the quite simple style. But once I got used to it I realized it fitted perfectly to the story. And the story, well you might have heard of it and don’t want to put spoilers but I think this is actually very realistic. I can so imagine something like this to happen. What a apocalyptic world! And I would make teenager read it. We read so much stuff in school. In German lessons of course the classics and only books that were initially in German but for English lessons this would absolutely fit also for foreign language students in their teens. Really, instead of reading something like “The Quiet American” which was as brutal but otherwise boring, I would have loved to read “The Hunger Games” instead at the age of 16 or 17 (had it been published back than already). The book should have everything to keep boys and girls engaged: it is adventurous, exciting, brutal but also very critical, it is about friendship and love. It kept at least me reading more than I usually do to find out how the story moves on. I think it teaches a lot and could spark lots of discussions. I need to order the next book to keep on reading! My nails are by the way another preparation for the Nail Challenge I’m planning. Topic is green. But more in a few days. Joing Ginny for her weekly Yarn Along, so what are you reading and knitting? This entry was posted in Knitting & Crocheting and tagged Blanket, Crochet, Knitting, Lace, Nailpolish, shawl, the more the merrier, Yarn Along by kathatravelling. Bookmark the permalink. I have mixed feelings on the HG Trilogy. I definitely liked the first one. Did you ever read “The Lottery” by Shirley Jackson? If you want to continue in the HG theme, I’d suggest that, and probably “The Long Walk” by Stephen King. Both of those are short stories/novellas. Also, I like the little starburst of dark green on the one nail. Thanks for these recommendations. I have to admit, I never read anything by Steven King so far but maybe it is worth a try. I loved the Hunger Games books, hope you do too. You have some great knitting in progress. I love looking at it through Ginny. I definitely agree with you on the Hunger Games – good, brutal, and sad all at the same time. And it makes me wonder how I would behave in those situations. I’d like to think knitting would help me through it all, but there may not be enough yarn in the world to get over being in the arena. And I’m loving the Rudolph sweater, with his huge red nose! I just imagine this: you in the arena and the only survival pack you are longing for is yarn with needles 😉 Hope you have nice sponsors… Just kidding. It is a really good book. Quite thought provoking! You know, of all the projects, I really love the colourwork! Try and focus on it and finish it. I can tell it will be a spectacular piece! And you are a neat knitter which makes everything perfect! Thank you! The fact that it is a gift especially wished for and has a deadline keeps me going so I’ll definitively finish it! Your Hunger Games says Stephen King but the ones I read was by Suzanne Collins. I am confused. Could you help me clear it up? It is confusing, isn’t it? 😉 No, it is not Stephen King but the design implies it. It is just that on the top of the cover there is a Stephen King comment on the book. Suzanne Collins’ name as the author is printed far less prominent on the bottom of the cover and you don’t see that part on the picture. O ok. Thanks for clearing that up. Have you ever tried a lifeline for the lace? I have never tried but it might be a good idea.